My first period, I got too excited as the icosahedron grew and took too central a role in the connecting/taping process. During the second class, I didn’t touch it. Instead, with ten minutes left in class — just enough time to finish if the class was motivated — I scooped some errant stack of papers off my desk and announced, “I’ve got your homework assignment for Memorial Day Weekend right here. I’m willing to cancel it [reluctant pause] IF you guys can make the icosahedron before the bell rings.” [cue frantic team-forming, leadership-role-assuming, fun-having, and homework-canceling]. If you’re dying like I am here, it’s a low-stress and low-impact way to fill a thirty minute bloc without falling prey to the pro forma time wasters: games, movies, and parties. I extracted the relevant bit from a larger pdf. Dan- Great little fun lesson. I agree, it sure beats throwing a movie in the VCR, hitting play and sitting at a desk for 52 minutes. Although, every once in several blue moons, there is nothing wrong with that (cue NCLB/”data driven” swat team). Math homework on Memorial Day? C’mon! You weren’t really going to do that were you? Just say, “hey, the year is almost over, you all have worked hard. Let’s do something different!”. But homework? How about “your homework is enjoy the weekend, get out and have fun. Go to a cookout or something”. OR, if you really wanted to give homework, have them find out how many World War I vets (US) are still alive? I think the answer is only four. How many World War II vets are still alive? Don’t know that one, but four or five million I would guess. If you wanted to get fancy have them figure out the percentages of those fought and those alive. If you wanted to get less serious, have them figure out how many In-n-Out burgers (a nod to you being on the left coast) one could buy each day with the amount of money the US is spending each day over in Iraq. Hey those are fun questions. The last couple are a bit politicized for a math class, but I’m definitely tossing the first ones out on a line. And, I’ve got to clarify: I was never going to assign homework over Memorial Day. That stack of papers was, I think, some completed classwork from another class. Maybe. I don’t know. I rarely assign homework anyway but creating a homework assignment only to cancel it is a fun, fast, and easy way to conjure up a reward for a hardworking class. Wow, I’m honored – I never saw my name “up in lights” on a blog post. Of course, I’m only passing it on from others, but that’s how we most often get our best stuff (right?). 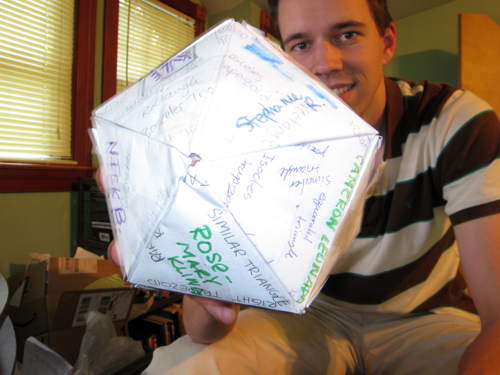 I like how you kicked it up a notch and gave the students more ownership of the icosahedron phase of the project, and how they got their names all of the finished product (mine are just plain boring white). I really like the cooperative effort of having THEM figure out how to put it all together…. just curious, did you show them a finished product to model what it should look like, or did you just let them work that out on their own? In the past I have used the old missionaries and cannibals problem for my opening day of sixth grade math (we always start on a Friday, which is sort of weird, and it just doesn’t quite lend itself to hitting the ground running with homework! ), but I’m definitely considering using this truncated tetrahedron > icosahedron one next year. I didn’t show my first class anything. (The second saw the first’s.) These are older kids and tactile learners which (as you’ve alluded to) kinda made them a warm, damp bed for this thing to spring up organically. They just start fitting stuff together and I told ’em to keep going. Good idea for an introductory lesson. Pingback: dy/dan » Blog Archive » What Do I Do?